Our Dove Weathervane, Sitting, was inspired by classic depictions of the Dove of Peace. The design was developed for a woman who participated in the historic 1986 Peace March across the United States. She wanted to commemorate the 25th anniversary by planting a ‘Peace Pole’ in her garden and topping it with a copper Dove of Peace that turned in the wind. Doves appear in the symbology of Judaism and Christianity and of both military and pacifist groups. 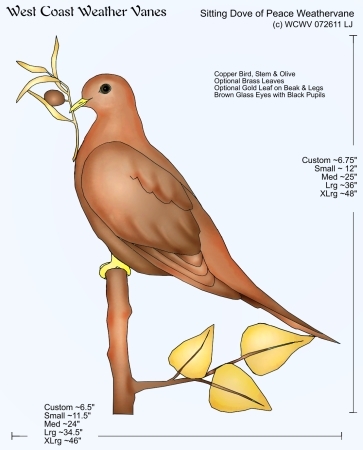 In this design, there is a bit of olive branch in the dove’s beak, and the leaves of the branch are illustrated as having optional gold leaf applied. 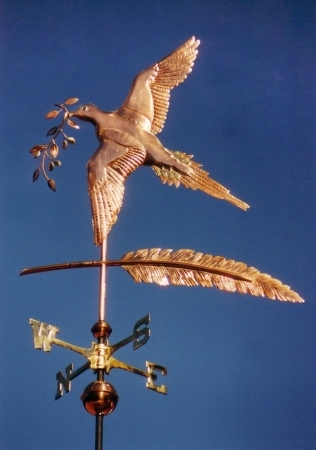 We also make a Flying Peace Dove Weathervane that is more active in its representation. Both are constructed in swell bodied style and have glass eyes. This design can be personalized by removing the olive branch, or replacing it with a plant you prefer. Another change could be changing the leaves to represent a different tree. These personalizing touches can make it truly ‘yours’.